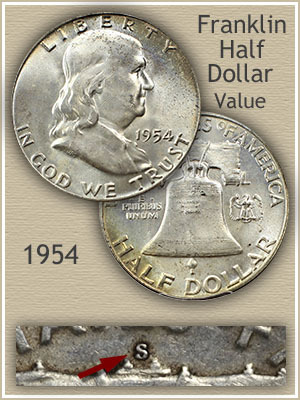 At $5.60 each your 1954 Franklin half dollar value is directly tied to its silver worth. Collector value enters the picture in the "uncirculated" grade. It is these quality coins that are in demand by collectors. All other grades and conditions of 1954 half dollars trade as bullion coins. A huge mintage year, millions of half dollars were struck by each of the three mints. Of these the San Francisco mint produced the least, just shy of five million pieces. The Philadelphia and Denver mints sent double to five times as many coins into circulation. Although not valued differently than the other mints a San Francisco 1954 half is by far the lowest in total produced, giving it a certain status. Perhaps in the future this equality in price will change? Just below the value chart finding the mintmarks is discussed. Discovering your coin is from San Francisco and beating the odds does give it character. Uncirculated or also known as mint state is the bold dividing line in 1954 Franklin half dollar value. Images below help judge and identify this important detail. Mint marks indicate which of the three mints operating at the time struck your coin. A classic set of Franklin halves includes each of these. Although not a large factor in value, finding the "S" mintmark used by the San Francisco mint is discovering the lowest production variety of the year. Denver used a "D" mintmark and Philadelphia - no mintmark. Time has been an asset for this 1954 half dollar. Care has been gentle, and its needs have been looked after. Pictured is a Franklin half whose aging process has been slowed down by proper handling. Protected from the harshest of the elements, the tendency of silver to grow dark and tarnished has been all but stopped. Eye appeal in the form of colorful toning has developed over the years enhancing this coin. Additionally, avoiding contact has retained marked free surfaces. Without this proper care it would certainly have become another worn, marked and lower valued half dollar. A high level of care has assured a high level of value, both esthetically and numismatically. In the market place, half dollars of this quality are in great demand by today's collector. Starting as a fifty cent piece in 1954, and rising with the price of silver over the years, minimum value as of 4/15/2019 stands at $5.60 . Now add in the premium of top notch care and this coin sold at a David Lawrence rare coin auction for $210. Use the combination of the three images below, your coin is either of the bullion value class or the higher value collector coin. Take your time, it is rather easy to judge a distinctly worn coin, however the difference is subtle to reach the uncirculated condition. 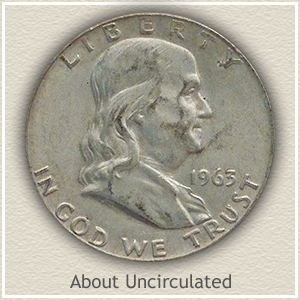 Uncirculated: A half dollar without any wear to the surface is defined as "uncirculated." The presence or absence of mint luster indicates quickly the effects of wear. Slowly rotate your coin under a light, notice the band of brightness that travels across the surface. This must be complete to qualify as uncirculated. Franklin's chin, cheek, and just above the brow are the highest points of the design and first to wear. A dulling of the metal, and when viewed with magnification as smoothness to the metal indicated wear. Take your time to judge if you believe your coin is a candidate for the uncirculated grade. It is the top 1954 Franklin half dollar value. 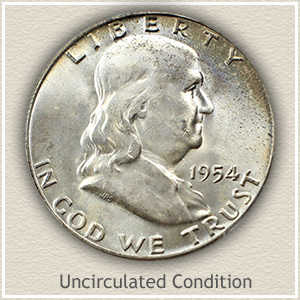 About Uncirculated: Trace amounts of wear indicate the "about uncirculated" grade. Use the image as a guide helping identify if your coin is a possible candidate for the coveted uncirculated grade. Between the two examples and descriptions you develop a collector eye distinguishing between grades. A slight color change to a darker shade on the high points of Franklin's cheek, and hair behind the ear are indicating wear. 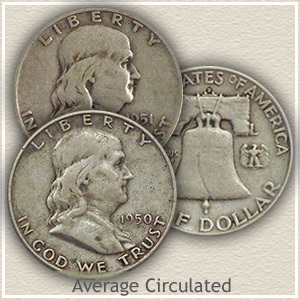 Average Circulated: Once a 1954 Franklin half shows prominent wear it is termed "average circulated" condition. This is more of a bullion related term than one use to denote a grade. If there is wear to the surface of your 1954 half and it is easily noticeable, it is well within the average circulated condition. 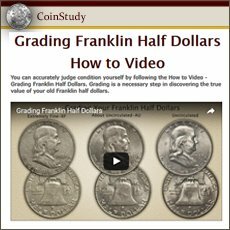 Return to Coin Values Discovery... find 1954 Franklin half dollar value and... All old US coin values. Use the image index to identify your coin, follow the link to value charts covering dates and mints of each series. 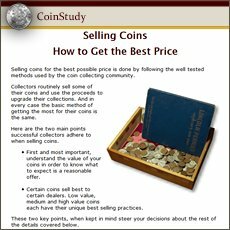 Importantly, condition of your coin is playing an increasing role in value. Each series covers the grading process in detail, helping find the complete value. 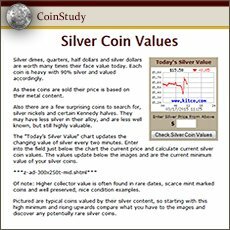 Silver value is dynamic, rising and falling over time. Franklin half dollars trend with this change. However there are exceptions, notably certain dates, mintmarks and ones in collectible condition. First minted in 1794 half dollars are an important and valuable part of today's coin collecting hobby. Value charts cover series starting with the first Bust and Seated halves, followed with the scarce Barber and popular Walking and Franklin half dollars.